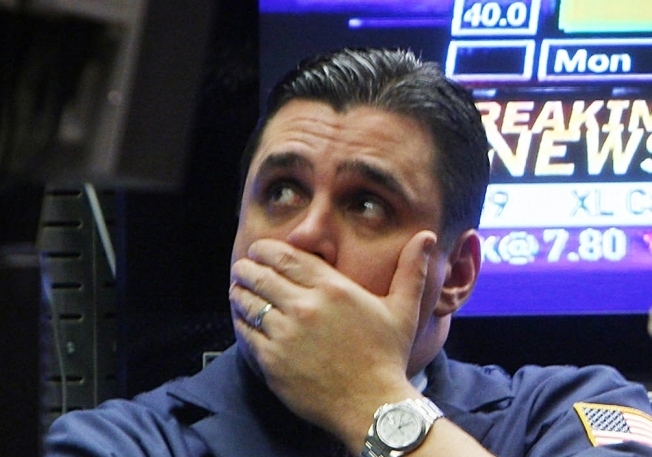 The Dow is down 36 percent in 2008. Not surprisingly, Americans spent much less on gifts this season than they did last year, according to SpendingPulse, a division of MasterCard Advisors. Retail sales dropped between 5.5 percent and 8 percent compared with last year, the data showed, or between 2 percent and 4 percent after stripping out auto and gas sales. Personal consumption is a huge part of U.S. economic activity — comprising more than two-thirds of gross domestic product — so Wall Street is nervous that a more frugal consumer could keep the economy weak in 2009. Investors did get a some good news on Christmas Eve, when the Federal Reserve allowed GMAC Financial Services — the finance arm of struggling Detroit automaker General Motors Corp. — to become a bank holding company and thus qualify for the government's $700 billion rescue fund. Analysts had said that without financial help, GMAC might have had to file for bankruptcy protection or shut down. There was little conviction behind the advance, which the market managed after stocks meandered for much of the session. With just three full trading days left in the year, no news has been upbeat enough to spark a big year-end rally, a consequence of the great uncertainty still in the market. December is usually a strong month for stocks, and a flurry of trading known as a "Santa Claus rally" is often seen in the final week. "I think we could have a year-end rally, but it's got a formidable headwind in the form of tax-selling, in my view," said Hugh Johnson, chairman and chief investment officer of Johnson Illington Advisors. Tax-loss selling is when investors sell their poorly-performing stocks to realize a loss for the year, which can reduce their taxes in upcoming years. According to preliminary calculations, the Dow Jones industrial average rose 47.07, or 0.56 percent, to 8,515.55 after Thursday's market holiday. Broader stock indicators also rose. The Standard & Poor's 500 index rose 4.65, or 0.54 percent, to 872.80, and the Nasdaq composite index rose 5.34, or 0.35 percent, to 1,530.24. The Russell 2000 index of smaller companies rose 6.28, or 1.33 percent, to 476.77. For the week, the Dow ended down 0.74 percent, the S&P 500 fell 1.7 percent and the Nasdaq lost 2.1 percent. As the year winds down, investors are flummoxed over what 2009 might bring. Some market analysts are predicting a stock market recovery, and others are predicting more volatility; but nearly all are doing so with the caveat that anything is possible. "It's hard to imagine another year that is going to be as dismal or dark or bad as 2008," Johnson said. "It's even hard to imagine that we have another down year in 2009 — the odds are the stock market will be higher at the end of 2009. Common sense tells you that." The Dow is down 35.8 percent for the year. But, Johnson added, it's impossible to forecast the end of a bear market, and "confidence can turn on a dime." On Friday, the dollar was down against other major currencies, while gold prices rose. Demand for government bonds increased. The three-month Treasury bill's yield fell to 0.01 percent from 0.02 percent late Wednesday, and the 10-year Treasury note's yield fell to 2.14 percent from 2.19 percent. Light, sweet crude rose $2.36 to $37.71 a barrel on the New York Mercantile Exchange. Crude prices had tumbled Wednesday for the ninth straight day — dipping as low as $35.13 — after gloomy economic reports and growing stockpiles of unused gasoline suggesting eroded demand. GMAC notes shot higher on the news of the company's transformation into a bank. GMAC's 7.25 percent note due to mature in 2033 rose 88.5 percent to $9.67 from $5.13 on Wednesday. But analysts were wary of the big price move, noting that volume was thin, and saying there is still much to be resolved about the company's finances. Japan on Friday reminded U.S. investors that the recession is not isolated to the United States. Japanese automakers and other manufacturers cut output last month by 8.1 percent — the biggest decrease since records began in 1953 — in the face of slowing demand overseas. Despite the plunge, Japan's Nikkei stock index rose 1.63 percent. In other overseas trading, Hong Kong markets were closed, as were those in Britain, Germany and France.